From the "Who throws a shoe?!?" 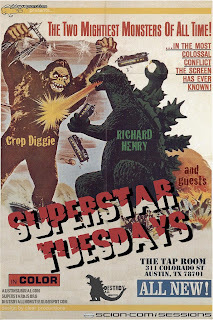 department... Superstar Tuesdays @ The Tap Room with Richard Henry and Crop Diggie! Taking the line from Austin Powers, "Who throws a shoe?!?" Bush brushes his shoulder off after an Iraqi throws 2 shoes at him. I might not think much Bush but I'll give props to his quick reflexes. That was PIMP!